321 Dartmouth is located on the east side of Dartmouth, between Beacon and Marlborough, with 255 Beacon to the north, across Alley 419, and 319 Dartmouth to the south. 321 Dartmouth was built ca. 1869 by Hiram P. Bean, mason, one of three houses (317-319-321 Dartmouth) built at the same time as a symmetrical composition, with a bow in the center and octagonal bays at either end. Click here for an index to the deeds for 321 Dartmouth. On December 20, 1869, Joseph Benjamin Moors foreclosed on a mortgage given by Hiram Bean and sold 321 Dartmouth to real estate dealer Henry Whitwell. On May 2, 1870, 321 Dartmouth was purchased from Henry Whitwell by Anna Cutler (Parker) Hinckley, the wife of attorney Samuel Lyman Hinckley. They previously had lived at 13 Newbury. Samuel Hinckley died in December of 1871. Anna Hinckley continued to live at 321 Dartmouth in 1875. During the 1875-1876 and 1876-1877 winter seasons, Anna Hinckley was traveling abroad and 321 Dartmouth was home of Mrs. Mary Elizabeth Wright, the former wife of Charles Henry Todd, and their unmarried son, Charles Francis (Todd) Wright (after Mary Wright’s divorce from Charles Henry Todd, she and their children took her maiden name, Wright, as their surname). They had moved to 326 Dartmouth by 1878. By the 1877-1878 winter season, Anna Hinckley was living at 321 Dartmouth once again. She continued to live there in 1883. During the 1883-1884 winter season, it was the home of Joseph Burnett and his wife, Josephine (Cutter) Burnett, and their unmarried son, Harry Burnett. Joseph Burnett was a chemical manufacturer and maker of flavoring extracts. He owned Deerfoot, a large summer estate and dairy farm in Southborough. In 1860, he had donated the Church of St. Mark’s in Southborough, and in 1862, he founded St. Mark’s School in association with the Church. By the 1884-1885 winter season, the Burnetts had moved to 164 Marlborough and 321 Dartmouth was the home of dry goods commission merchant Eugene Battelle and his wife, Susan Parkman (Munro) Battelle. They previously had lived in Dorchester. By the 1885-1886 season, they had moved to 134 Marlborough. During the 1885-1886 winter season, 321 Dartmouth was once again Anna Hinckley’s home. She continued to live there during the next season, but moved thereafter. She continued to own 321 Dartmouth and lease it to others. 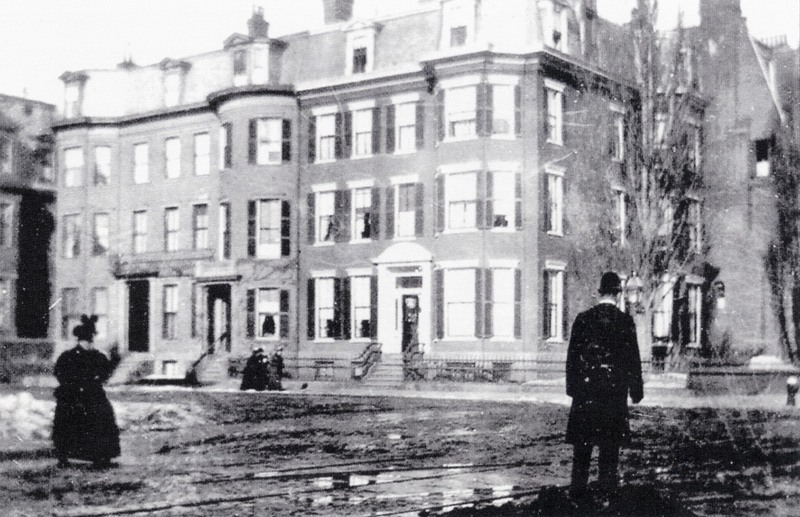 During the 1887-1888 winter season, 321 Dartmouth was the Boston home of retired cotton buyer and dry goods merchant George Wellman Wright and his wife, Georgianna (Buckham) Wright. He was the brother of Mary Elizabeth Wright, who had lived at 321 Dartmouth in the mid-1870s. Their primary residence was at Pine Hill in Duxbury. During the 1888-1889 winter season, the Wrights lived at 369 Beacon and 321 Dartmouth was the home of Mr. and Mrs. L. Day. By 1890, the Days had moved and the Wrights had moved back to 321 Dartmouth. They continued to live there during the 1890-1891 season, but moved soon thereafter. 321 Dartmouth was not listed in the 1892 Blue Book. During the 1892-1893 winter season, it was the home of John Vaughan Apthorp, a dealer in real estate and mortgages, and his wife, Mary Sarah (Sargent) Thomas Apthorp. They previously had lived at 178 Marlborough. By the 1893-1894 season, they had moved to 352 Marlborough. 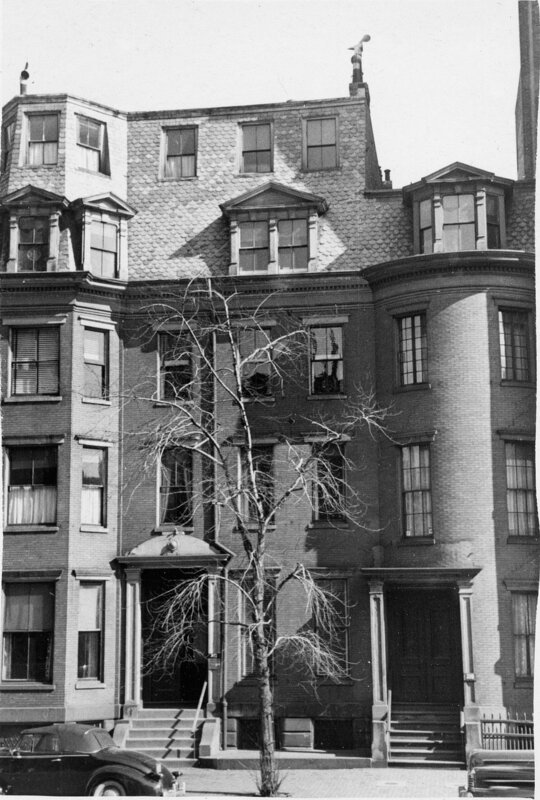 By the 1893-1894 winter season, 321 Dartmouth was the Boston home of James Frothingham Hunnewell and his wife, Sarah Melville (Farnsworth) Hunnewell. They also maintained a home at 13 Green in Charlestown. James Hunnewell was a merchant and author of historical and genealogical works. The Hunnewells continued to live at 321 Dartmouth during the 1894-1895 season, but moved soon thereafter to 289 Beacon. During the 1895-1896 winter season, 321 Dartmouth was the home of Henry Sidney Everett and his wife, Katherine Pickman (Fay) Everett. They had lived at 108 Marlborough during the previous season. H. Sidney Everett had served as Chief of the US State Department’s Diplomatic Bureau in Washington from 1885 to about 1892. By the 1896-1897 season, the Everetts had moved to the Hotel Hamilton at 260 Clarendon. 321 Dartmouth was not listed in the 1897 and 1898 Blue Books. Anna Parker Hinckley died in March of 1898, and on April 22, 1898, 321 Dartmouth was purchased from her heirs by Dr. Robert Means Lawrence. He and his wife, Katharine Lawrence (Cleaveland) Lawrence, made it their home. They previously had lived at the Hotel Brunswick (southeast corner of Clarendon and Boylston). Dr. Lawrence was a physician and author of genealogical works. The Lawrences continued to live at 321 Dartmouth until about 1907, when they moved to 209 Bay State Road. 321 Dartmouth was not listed in the 1907 Blue Book. During the 1907-1908 winter season, 321 Dartmouth was the home of William Ellery Channing Eustis, a metallurgical engineer. He was a widower and two of his adult children – Augustus and Mary – lived with him. They had lived at 413 Beacon in 1907. Their primary residence was in Milton. 321 Dartmouth was not listed in the 1909 Blue Book. On January 16, 1909, 321 Dartmouth was acquired from Robert Lawrence by Harriet Wolcott (Parker) Reynolds, the wife of Dr. Edward Reynolds, a surgeon and obstetrician. They lived in Milton and converted 321 Dartmouth into his medical office and a private hospital. Dr. Reynolds’s nurse, Miss Mary E. Moore, lived at 321 Dartmouth. Soon after acquiring 321 Dartmouth, the Reynolds remodeled the building and added an additional story. 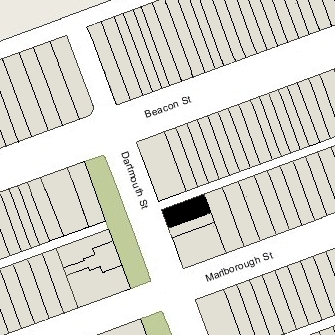 The house appears as a four story building on the 1908 Bromley map, but as a five story building on the 1912 map. On September 25, 1918, Harriet Reynolds transferred the property into Edward Reynolds’s name. Dr. Reynolds continued to maintain his offices at 321 Dartmouth in the 1920s. He retired from medical practice in 1922 and 321 Dartmouth ceased to operate as a hospital. Mary Moore continued to live there, operating an office for orthopedic corset fitting and accepting lodgers. In June of 1927, Dr. Reynolds filed for (and subsequently received) permission to remodel the building and change its use from being a hospital, doctors’ offices, and dwelling, into a residence and doctor’s office. Thereafter, Dr. and Mrs. Reynolds made 321 Dartmouth their home as well as his medical office. Their son, George Philip Reynolds, also a physician, lived with them but maintained his practice at 311 Beacon. Miss Moore also continued to live at 321 Dartmouth. George Reynolds continued to live at 321 Dartmouth until about 1931, and Miss Moore continued to live there until about 1933. Edward Reynolds died in October of 1936. Harriet Reynolds continued to live at 321 Dartmouth until about 1951. The house also continued to be medical offices for several physicians. 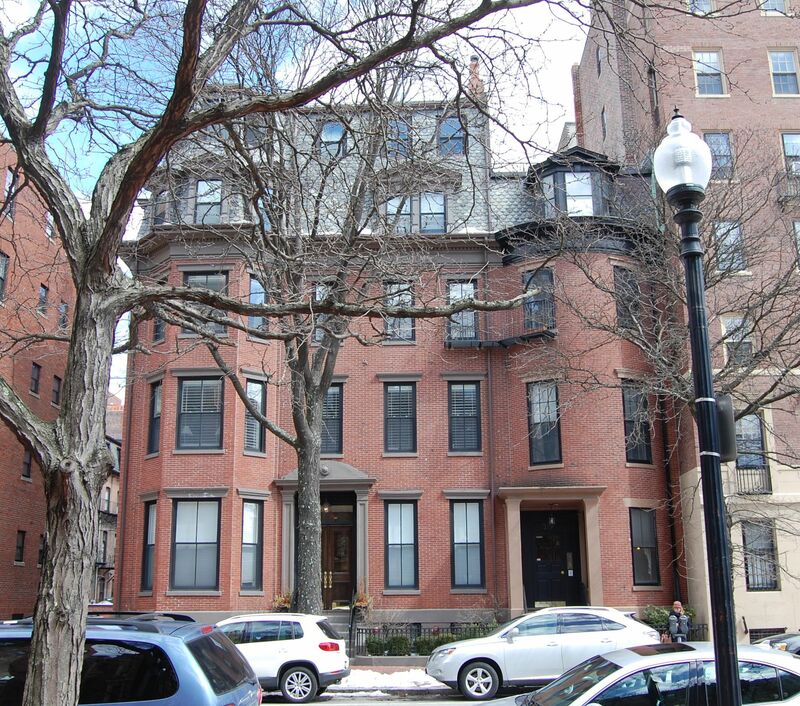 On October 1, 1951, 321 Dartmouth was acquired from Edward Reynolds’s estate by Shirley Clifford Speed, a real estate dealer who converted many Back Bay houses into lodging houses and apartments. In December of 1951, he applied for (and subsequently received) permission to convert the property from medical offices and single-family dwelling to seven apartments. On November 26, 1952, 321 Dartmouth was acquired from S. Clifford Speed by M. Jane Buckley of Melrose. The property subsequently changed hands and on August 12, 1964, was acquired by architect and real estate dealer Thomas Byrd Epps and his wife, Margaret Killeen (Lonval) Epps. They lived one of the apartments and he maintained his office at 73 Newbury. They previously had lived briefly in an apartment at 78 Commonwealth and, before that, at 1 Otis Place. Thomas Epps died in November of 1980. On November 1, 1982, 321 Dartmouth was acquired from Margaret Epps by William Eric Fine and his wife, Dorothy H. Fine. On September 9, 2005, 321 Dartmouth was purchased from the Fines by the 321 Dartmouth Street LLC (Barkan Properties LLC, managers of record). In October of 2005, it applied for (and subsequently received) permission to convert the property from seven apartments to four apartments. 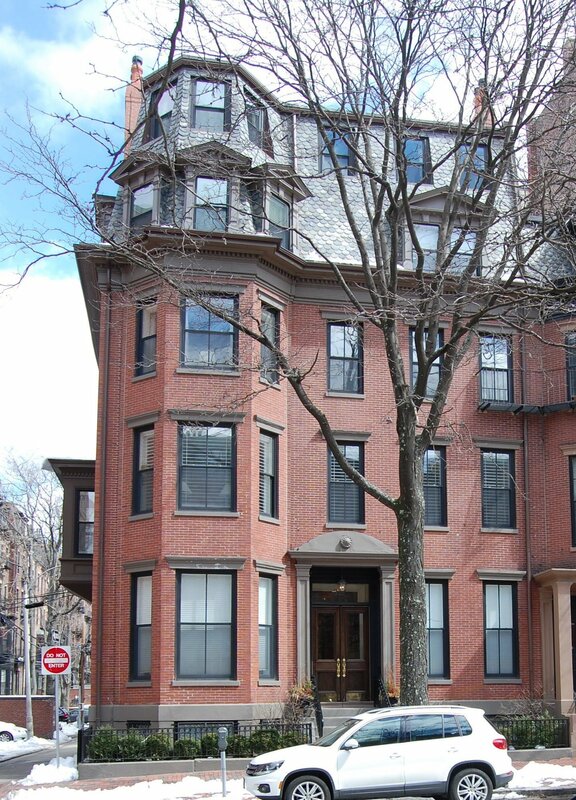 On October 16, 2006, 321 Dartmouth Street LLC converted the property into four condominium units, the 321 Dartmouth Street Condominium.